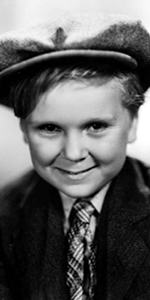 Jackie Cooper was a popular child actor, originally a member of Hal Roach's Our Gang films; he broke through to star in features by age eight, and continued his career, acting in films and television and directing. Born into a family with showbiz connections, Cooper's father left when he was two years old. His grandmother began talking him around the studios, hoping to get either one of them some extra work. At the age of three, he began appearing in the short film comedies of Lloyd Hamilton on the Fox lot, where he also appeared in the Fox Movietone Follies of 1929, and the Janet Gaynor starrer Sunny Side Up (which played the Chinese in November, 1929). His director for these films, David Butler, recommended Cooper to director Leo McCarey, who was then overseeing Our Gang comedies for Hal Roach. Cooper was signed to a three-year contract. In his first Our Gang film, Boxing Gloves (released in September, 1929), Cooper is a minor character, but as sound came in, Cooper's scene-stealing way with doing his lines brought him more screen time: The First Seven Years (released in March, 1930), When the Wind Blows (released in April, 1930), Teacher's Pet (released in October, 1930), School's Out (released in November, 1930), and Love Business (released in February, 1931). They worked those moppets back then! In early 1931, Cooper was loaned out to Paramount, where Cooper's uncle, Norman Taurog, was directing a picture called Skippy (released in April, 1931). The heartwarming film with Cooper in the lead role, made him a star overnight. Cooper was even nominated for the Best Actor Oscar. Roach sold his contract with Cooper to Metro-Goldwyn-Mayer, who knew just what to do with the young star: put him in a tearjerker with Wallace Beery. The result, The Champ (which had its world premiere at the Chinese in November, 1931, and which was playing at the theatre when the Forecourt ceremony was held), became a hit, and provided Cooper with a surrogate father of sorts in Wallace Beery, with whom he would make several pictures together: The Bowery (released in October, 1933), Treasure Island (released in August, 1934), and O'Shaughnessy's Boy (which played the Chinese in October, 1935). Cooper headlined in two or three films a year. 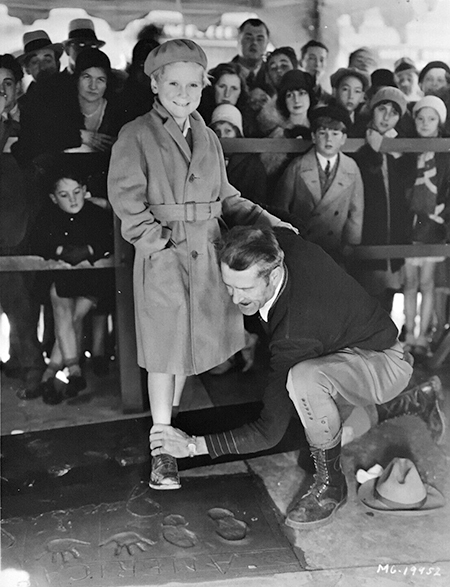 In 1939, Cooper was pushing 17, which is a difficult time for a child star. M-G-M gave him the part of playing popular comic strip and radio character Henry Aldrich in What a Life (released in October, 1939), and Life with Henry Aldrich (released in January, 1941). Cooper joined the Navy and became an aviator in World War II, where he served in the South Pacific. Cooper remained a reservist for many years after the war, tirelessly promoting the military tradition. After the war, Cooper played Ensign Pulver in a stage production of Mr. Roberts in Boston, Massachusetts. His next move was television: He guest starred on The Ford Show (1952), but was the lead character in both The People's Choice (1955-1958), and Hennessey (1959-1962). From 1964 to 1969, Cooper became vice-president of development at Columbia's Screen Gems, where he helped get Bewitched (1964-1972) on the air, as well as Gidget (1965-1966), reportedly giving Sally Field her big break. In the 1970s, Cooper found work directing for television, working on episodes of M*A*S*H (1972-1983) and The White Shadow (1978-1981). In June 1977, Cooper rushed to England to take over the role of Parry White for an ailing Keenan Wynn in Superman, the Movie (which played the Chinese in December, 1978). Cooper's autobiography, Please Don't Shoot My Dog was published in 1982. Cooper retired from the screen in 1987, and directing in 1989. An avid horseracing fan, he spent much time raising and training his ponies. He died after a short illness, at age 88. Grauman's Chinese Theatre, Hollywood, California. Jackie Cooper Forecourt ceremony, Thursday, December 12, 1931. A fairly young group of onlookers watch as Cooper is assisted in making his impressions by cement artist Jean Klossner.